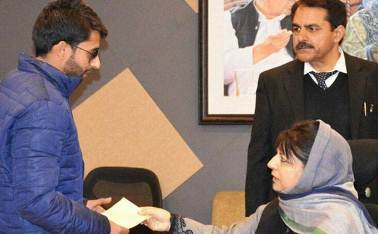 Srinagar: Stating that jobs for pellet victims of Kashmir were another discrimination with Jammu region, several social and political organizations are seeking a share in the policy. “This is another discrimination with Jammu. First they use pellets in Kashmir and let them steal the limelight. They dominate the news, and now they are stealing jobs too,” Harsh Dev Singh, a senior leader of Jammu based, Jammu a nd Kashmir National Panthers Party said. At a joint press conference of various social and political organizations, Singh demanded that the government should include eye infections in the policy to create a balance. Singh threatened his party would call for a Assembly gherao, if government fails to come up with a notification in this regard. Meanwhile, Jammu Mukti Morcha (JMM), an organisation demanding statehood for Jammu province have called for Jammu bandh on next Monday to protest the alleged discrimination meted out to Jammu people. The organization has appealed Jammu people to wear black goggles as a mark of protest against state’s government job disparity policy. “Market me ek bhi kala cheshma nahin rahe ga, tab Mehbooba ji to pata chlaga (We will not leave even a single black google in the market, then Mehbooba Mufti would realise,” JMM president Virender Gupta told Dapaan.